The V12 Vantage-based Zagato road car is set for debut at the Frankfurt Auto Show. The Aston Martin V12 Zagato racer has finally received its road car companion. 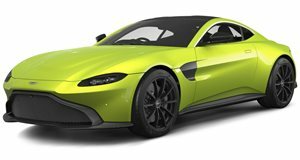 The V12 Vantage-based V12 Zagato road car has been unveiled today and it is set to debut in September in Germany. We recently saw the V12 Zagato racer endure the grueling Nurburgring 24 Hours earlier in the year. The road car keeps the racer&apos;s traditional lines while featuring a 6.0-liter V12 engine. The motor elicits 510hp and 420lb-ft of torque. The car is built on Aston Martin&apos;s aluminum platform and features plenty of carbon fiber. The Aston Martin V12 Zagato will debut at the 2011 Frankfurt Auto Show next month. Production is limited to 150 units, due in part to the time-extensive Zagato designed panels being hand made out of aluminum or carbon fiber. Pricing is expected to be in the region of $550,000.